Thank you to those who registered for the April 1-4 NWCU; we look forward to seeing you. For those not attending, know that we will miss being with you. a link to a survey for ALL CADEIO members and associates to complete. Conducted as a joint effort between CADEIO and the USCCB-SEIA, the feedback from this survey will help identify ways in which we may serve you better. Please complete the survey by Friday, March 29. It will only take a few minutes to do so! On behalf of CADEIO’s executive committee, I would like to thank you for your work and support of CADEIO and SEIA as we journey together toward Christian unity and the common good of all humanity. This entry was posted in News and Updates on March 29, 2019 by CADEIO CADEIO. 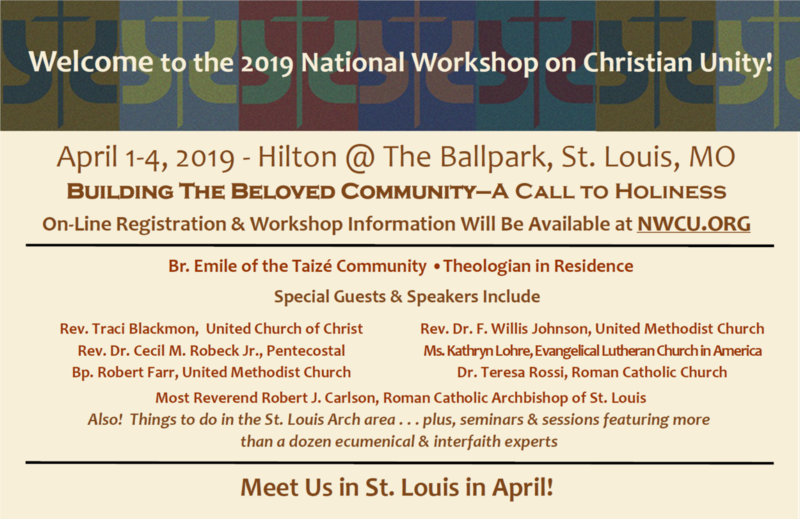 • National Workshop on Christian Unity which will be held in St. Louis, Missouri, April 1-4, 2019. Hotel group rates and early bird registration fees are available until March 7. You may view the complete NWCU schedule (April 1- 4,2019) at www.nwcu.org. Spiritual ecumenism, Beloved Community: Gaudete et Exultate, and dialogue are common themes woven throughout this year’s workshop. I am excited to say we have wonderful Catholic representation in the plenary, seminars, and network sessions. 1. There are no denominational liturgies scheduled at the hotel during the workshop. Bro. Emile from Taizé will be present the entire workshop, and he will lead prayer and worship services in common for all to participate in together. The Old Cathedral Basilica is a five-minute walk, and daily Mass is held at 7:00 a.m. and 12:10 p.m.
2. Monday morning is the CADEIO Board of Directors meeting, followed by 12:10 pm regularly scheduled Mass at The Old Cathedral Basilica of St. Louis. All CADEIO members are invited to attend Mass. The Monday afternoon’s CADEIO session will be a facilitated discussion to talk about the significance of CADEIO’s work in the Church with time spent 1) identifying ways to build stronger networks and engage young adults in ecumenism; 2) assessing current ecumenical formation opportunities and ways these might be shared through CADEIO; and 3) discuss any other concerns raised by members. Fr. Erich Rutten will facilitate this discussion. CADEIO Regional meetings will be held following the open discussion. 3. Thursday morning from 8:30 am – 9:30 am is when the CADEIO General Assembly will be held. This is the time allotted for network business meetings, which in the past, were held on Wednesday afternoons, and in 2018 on Monday afternoon. 2019 is CADEIO’s election year for officers and will take place at this meeting. The CADEIO General Assembly meeting is also the time when reports are given and the Fitzgerald Award is presented. Regional Representatives, Committee Chairs, Program Budgets and Liaison Reports are due by March 4, 2019. Please email these to me at skrehotj@stthom.edu. jwallace@notredamedelamer.org. Dues must be paid in order to vote. CADEIO dues letters were recently mailed to ecumenical officers. If you have not received yours please contact Rick Caporali: rcaporali@stbernpar.org. Thank you for all you do in service of God and His church, the body of Christ. This entry was posted in News and Updates on February 27, 2019 by CADEIO CADEIO.